Pilot Study on Interval Colon Cancer: Missed Colon Cancer or Fast Growth from a Serrated Polyp? Deemer, A., Gheith, S., Grau, J., Dale, E., Holihan, N., Jeff Wisotzkey, J., Bub, D. (2016, July 29) Pilot Study on Interval Colon Cancer: Missed Colon Cancer or Fast Growth from a Serrated Polyp? 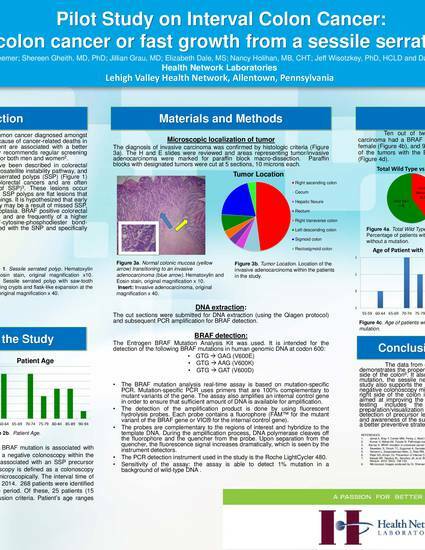 Poster presented at LVHN Research Scholar Program Poster Session, Lehigh Valley Health Network, Allentown, PA.